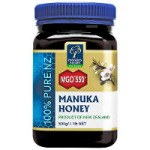 MGO 550+ Manuka Honey has the highest MGO rating of all MGO manuka honey. Manuka Health tests its honeys in the company's own laboratory and is a pioneer of the manuka honey industry. MGO 550+ Manuka Honey has the highest level of MGO in the Manuka Health range, so consumers wanting a genuine manuka honey could try this for size. A large jar of amazing honey with an amazing taste.